COLUMBIA, S.C. - (November 4, 2008) - As Election Day comes to a close, the South Carolina State Election Commission projects a record-breaking voter turnout. With an overwhelming number of voters participating in the voting process, the South Carolina State Election Commission estimates a record turnout that is likely to exceed the previous record set in 2004. "This is a huge testament to the citizens of South Carolina and their ability to come together at this dynamic time," said Marci Andino, executive director of the South Carolina State Election Commission. "The fact that this state has more than 2.5 million registered voters, most of whom participated in today's General Election, is monumental. We appreciate their preparation, enthusiasm and patience as they went to the polls and cast their ballots today." "More than 20,000 poll workers and election officials across the state worked diligently in the months and weeks leading up to this election to ensure the day ran as smoothly as possible and we are thankful for their tireless efforts," added Andino. COLUMBIA, S.C. - (November 3, 2008) - More than 300,000 South Carolinians have cast absentee ballots in the 2008 General Election, nearly double the number of absentee ballots cast in 2004. On Tuesday, the other 2.2 Million registered voters who did not vote absentee are eligible to cast their ballots at polling places throughout the state. With that in mind, the South Carolina State Election Commission wants to provide voters with answers to some commonly asked questions in an effort to make the process go as smoothly as possible. Q. Where do I vote? A. You must vote at the polling place in the precinct where you reside. Your precinct is the geographical area you live in; your polling place is the location where you vote. Your precinct and polling place are listed on your voter registration card. However, polling places change from time to time. Aiken: 9:00 a.m. - 12:00 p.m.
Anderson: 9:00 a.m. - 1:00 p.m.
Beaufort: 10:00 a.m. - 2:00 p.m.
Berkeley: 9:00 a.m. - 1:00 p.m.
Charleston: 9:00 a.m. - 1:00 p.m.
Clarendon: 9:00 a.m. - 2:00 p.m.
Colleton: 8:00 a.m. - 2:00 p.m.
Dorchester: 9:00 a.m. - 1:00 p.m.
Greenville: 9:00 a.m. - 1:00 p.m.
Hampton: 8:00 a.m. - 2:00 p.m.
Horry: 9:00 a.m. - 12:00 p.m.
Lexington: 9:00 a.m. - 12:00 p.m.
Orangeburg: 9:00 a.m. - 12:00 p.m.
Richland: 9:00 a.m. - 1:00 p.m.
Spartanburg: 9:00 a.m. - 12:00 p.m.
Union: 9:00 a.m. - 1:00 p.m.
Williamsburg: 10:00 a.m. - 2:00 p.m.
York: 9:00 a.m. - 1:00 p.m.
COLUMBIA, S.C. - Approximately 2,552,000 voters are eligible to vote in the 2008 General Election, a record high in South Carolina. The number of registered voters in the state has increased by 310,000 since January 1st. Also, more than 218,000 absentee ballots have been issued throughout the state, far surpassing the previous record of 169,000 absentee ballots issued before the 2004 General Election. Myth: South Carolina has "early voting," meaning anyone can vote early for any reason. TRUTH: South Carolina has "absentee voting." You must meet one of 17 reasons for voting absentee. 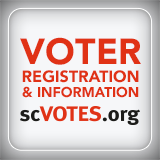 For a complete list of reasons, visit scVOTES.org or call or visit your county voter registration office. Myth: Absentee votes don't count unless the election is really close. TRUTH: Every vote matters, and every vote counts. Absentee ballots are usually the first votes counted on Election Day. 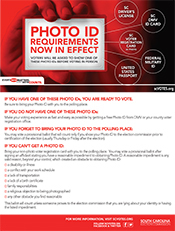 Myth: New regulations require a picture ID as well as a voter registration card for the elections this year, and all the information between the two will have to match. COLUMBIA, S.C. (October 23, 2008) - More than 190,000 voters have requested absentee ballot applications for the 2008 General Election, and nearly 160,000 absentee ballots have been issued. In the last presidential election (2004), approximately 160,000 absentee ballots were cast. There is still time to vote absentee, but deadlines are approaching. If you are aged 65 or older or are unable to make it to the polls on Election Day, you are likely eligible to vote an absentee ballot. 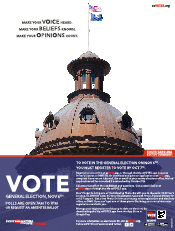 For a full list of qualifications to vote absentee, visit scVOTES.org(http://www.scvotes.org/south_carolina_voting_information_page). Many South Carolina voters have received a chain e-mail containing incorrect information regarding straight party voting. The basic claim is that straight party voting does not apply to President. The information in this e-mail is based on old state law that is no longer in effect. Straight party voting applies to President and all other partisan offices on the ballot. Straight party is the first choice a voter is presented with when voting a General Election ballot in South Carolina. If a voter chooses to vote straight party, each candidate that party has nominated for any office on the ballot is automatically selected. Voters can later change their choice for individual offices (also known as crossover voting). COLUMBIA, S.C. (October 7, 2008) - The deadline to register to vote in the General Election has passed, and preliminary numbers show the number of registered voters in South Carolina has increased more than 240,000 in 2008 by and now stands at 2.5 million. This number will continue to rise as county voter registration offices continue to process applications received by the deadline. Prior to the 2004 General Election, voter registration rolls increased by approximately 200,000 voters. In that election, 70% of registered voters cast votes - a record number. "The fact that nearly a quarter of a million South Carolinians have taken the first step to exercise their right to vote this year is truly encouraging," said Marci Andino, executive director of the South Carolina Election Commission, "and the fact that registration has outpaced that of 2004 points to the possibility we could see an even stronger turnout this year. Absentee voting is underway throughout South Carolina. 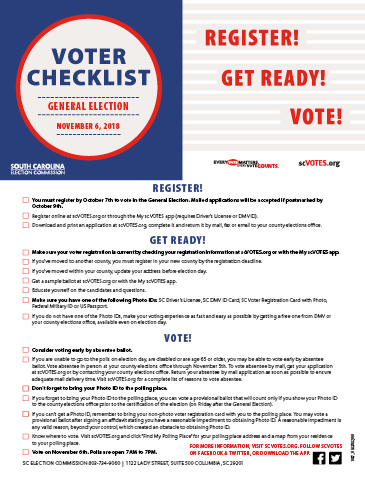 COLUMBIA, S.C. - The State Election Commission wants to remind those not already registered to vote that they must register no later than October 4th to be eligible to participate in the November 4, 2008, General Election. 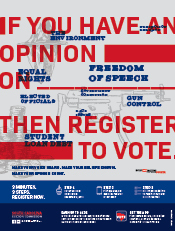 Visit your county voter registration office. County offices are open weekly during regular courthouse hours, generally 8:30 to 5:00. Also, many offices will be open Saturday, October 4th. Please see the list below regarding your county's hours on that date. 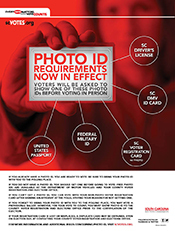 The display of campaign material is not allowed within 200 feet of any entrance to a polling place on election day. This law applies to any type of visual display of campaign material, including posters, pamphlets, brochures, signs, buttons, hats, t-shirts, etc. Voters displaying campaign material who enter the 200-foot area will be asked to remove the material, cover the material, or otherwise cause the material not to be seen. SECTION 7-25-180. Unlawful distribution of campaign literature.